It hit me while I was sitting at my vanity putting on makeup on a weekday, just like that God whispered in my ear, “write it down, write about your experiences, this is your gift.” I felt an overwhelming rush go thru my body as I have never heard God speak to me in such a way before. Who am I to write like this? I’m not an author. I’m not someone famous nor even someone with a great education. I’m just a high school graduate, one that didn’t even like school! But apparently being me is enough because I do have a story to tell and hopefully something I share will hit home with you. 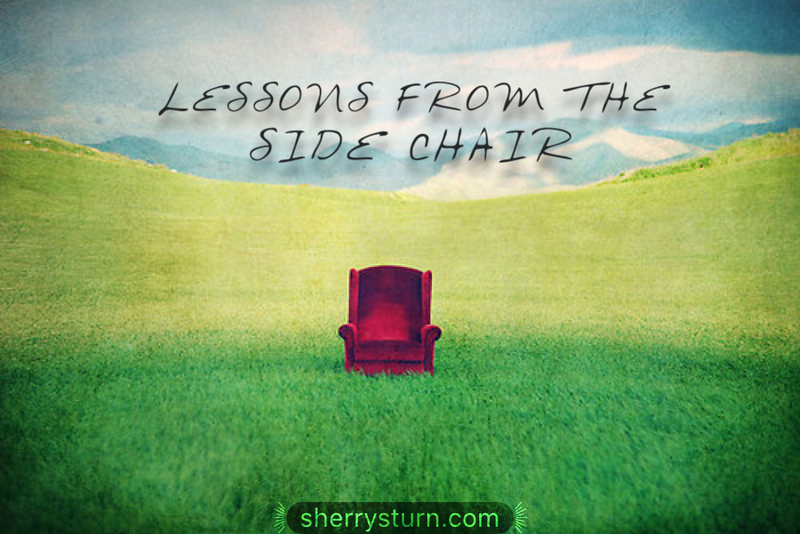 I’ll be sharing with you a new part of my blog called, “Lessons From the Side Chair” chapters of my life that affected me both in positive and negative ways and how I learned from them. I knew at a young age that something was different with me. I developed faster than some of my friends, looked older than I was. Older boys and even men looked at me differently. Growing up in a Pentecostal home, I was taught to be conscious of the way I dressed, always modestly and ladylike. Church was the center of our lives. I attended youth camps in the summer, youth trips during winter breaks, Christian concerts every chance I got. I was active in church. Dated church boys, hung around church kids. You get the picture. How on earth could anything bad happen to me if our lives centered around church? I questioned that for years. I blamed God even, till I finally realized that it wasn’t God, it wasn’t the church we attended, it was people. People cause hurt and pain. It was people who I needed to forgive. It was my “Ah Ha Moment” to be honest. I couldn’t blame God anymore for my hurt or the church, I had to place the blame where it belonged. On those individuals who hurt me, and I needed to forgive and forget. Hard to do. But thru doing so, I am growing in Christ. I remember an incident when I was around thirteen/fourteen years old and one of the ministers at our church had a side business. He hired a bunch of us kids to pass out flyers door-to-door in various neighborhoods to advertise his business. We were paid by the hour and it was great to earn a little money in the summer, plus I was working with my friends from church. We’d start early in the morning and usually finish by noon. This particular day one of the kids didn’t show up so we were short a person. We always went out in teams of two. I ended up going out by myself. The driver was one of the employees of the company, a grumpy older man and he didn’t really care that he was sending a young girl out on her own. I took my stack of flyers and got out of the car to start my route in an unfamiliar neighborhood in a town I didn’t know. When I finished my route I waited in the designated pick up spot for what seemed like hours. The driver never showed up. I remember sitting there for a long time thinking he was punishing me because I complained about having to be by myself. As the hours ticked away I became very scared. Not knowing where I was and not having a penny in my pocket, I knew I just couldn’t just sit there any longer. I started to walk to the nearest busy street. I kept my eye out for the car that was to pick me up the entire time I was walking, hoping & praying that he would show up and be as relieved to see me as I would be to see him. But I never saw that car or that driver. I came up to a 7-Eleven convenience store and walked in asking the clerk if I could use their phone. She told me their phone was not for public use but there was a public pay phone out front. I explained that I was lost and had no money. She shook her head and said, “sorry kid.” She was talking to a man who she said was a truck driver, he volunteered to give me a ride. I quickly declined and went outside. Since I had no money to make a call I started walking back to the designated pick up spot, hoping that maybe the driver would be there waiting on me. Hours have passed by now and what I didn’t know is that the driver had picked up all the other kids who worked that day and drove them back home. He then had to make the call that I was missing. My mother, who worked at the same place as my grandfather, was notified and began making a police report for a missing person. Can you imagine the horror as a parent receiving this call? It sends shivers down my back just writing this. As I sat on the curb in the beginning of the dusk of night, the driver pulled up. I had been “missing” now for hours and his first reaction was to just scream at me, loudly. I climbed into the backseat of the car and cried the whole way home as he yelled at me. Yelling at me how it was my fault, how bad I was, why couldn’t I just be like the others? Instead of rejoicing in being found, I was being blamed, degraded and told it was all my fault. Even though my parents reassured me that I wasn’t at fault, it was branded in my brain already. I look back at this incident and think about how God had his protective hand on me the whole time. He kept harm from me as I sat alone on the curb in a strange neighborhood in a town I didn’t know. He gave me the wisdom to say no to a ride with a stranger. He guided my walk and led me where I needed to be. Though it was a very scary experience for my family and myself, I learned from it. I learned to trust in God’s small voice when he whispers words of warning. I learned to trust that God is always in control, no matter how scary the situation is. And that forgiveness is not always easy, but always necessary. No matter how old you are or were. He will protect and guide you.